This blog will record each week's lesson and include notes, quotes and thoughts around discussions and content given in the #INM380 lectures at City University London. How do libraries respond to the publishing revolution? In our lecture this week, we heard from Diane Bell (Research Librarian at City University London) and Dr Katharine Schopflin (an academic and LIS lecturer at UCL). Though different in focus, they both concerned how libraries have responded and adapted to change in the publishing world. What also came up was a discussion about the nature of open access funding. Why is it that there is an expectation on research institutions to have enough money to pay for their work to be published. Ernesto spoke about that he thought might be the reason. 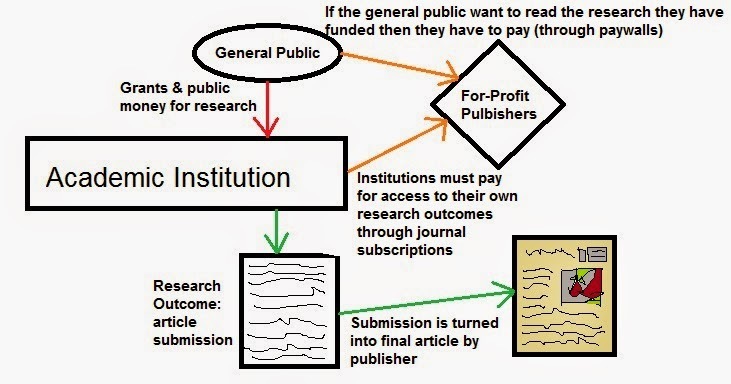 Open Access for some big business publishers is simply an inversion of their funding model, rather than a revolution. Instead of deconstructing the model, the costs are swung round to the producers. Also open access started mainly in the sciences. Many large scale science projects will be funded by military and government agencies. In these examples, a research unit will have large funding reserves and can use open access to promote the impact of the work. Publishers have a history of dealing with well funded science research when it comes to open access. This is however not the case for any researchers, such as humanities and social sciences, who often will not have the same limitless reserves. Perhaps if we want a different funding solution we need to take ownership of it (as library professionals). In class I raised the issue of a new OA funding model/idea that my friend mentioned to me: platinum open access. I found Martin Eve's book very useful on understanding different definitions of open access models: Open Access and the Humanities. As I understand it, platinum OA is open access publishing similar to gold OA however authors do not pay for their content to be published. Instead other means are used, such as charitable funds, voluntary work or other funding grants. too much of a focus "on access for consumers but not for authors"
"it does not address the severe disadvantage overseas authors, particularly those from the global south, are likely to experience faced with the demand to pay UK-level APCs"
" More generally, less well-endowed universities are likely to be able to offer less to their staff in terms of support for APCs, thus inhibiting their ability to publish." " Under this model, journals (such as this one) are online, open access, using open source software, hosted by universities, and run by volunteer academic labour, with reviewing and editing tasks being institutionally acknowledged and rewarded in other ways. They offer true open access, i.e. are free for consumers to read (globally) and for authors to enter (globally). The relatively low cost of server space is borne by the host institution at considerably less cost than either journal subscriptions or APCs." The nature of publishing has changed. A number of factors have influenced this transformation. There is a suggestion that this change in culture is entirely due to emerging technologies. I would disagree. Although I concede that new technological advances caused seismic shifts, I believe it is worth consider the social and political landscape of these changes, how and why these technologies were invented. Just as Adam Curtis describes in his epic second installment of 'Machines of Loving Grace', there is a strong relationship between the material need for rare items and the digital realities that they are used to create. He cuts between scenes of oxford circus as people queue for the new playstation with images of armed conflict in the Congo over control of precious metals to sell to the west to build the playstation console. I believe that disruptive technologies and societal relationships have an interdependent relationship. I think that this is true of publishing too. Disruptive technologies can be born out of a societal problem as we can only invent what we can dream and we can only dream of what we want (as opposed to what we have). The explosion of information that was made possible by new digital technologies was build out of hacker cultures that were dependent on finding alternatives. Yes, the archetiture of the internet was built by governmental scaled institutions: ARPANET et al.... but it was the applications and the inventions of distribution that were mainly the produce of small groups of individuals working to find different ways of communicating across technology. Publishing has and is adapting to disruptive technologies but I think that it is worth stressing that these technologies were built by people often for noble or problem-solving purposes. With that in mind, what has been the disruption to publishing by technology? Some would say that it has been democratised by open access and by digital copies which in past 'future' predictions were considered cheaper (there not if the publishers overprice them!!!!). The notion of value added has to creep into the trade publishing model. If other people are allowing access to content free of charge then why would someone pay for content from a publisher such as penguin random house? Value added could be the production of a printed book or the cost to institutions rather than end users for publishers to host and package open access content. Value added could be the curation of public domain content into attractive packages. Publishers, just as librarians, can be navigates to content, especially when it is so easy to become overwhelmed by content overload. Ernesto described a situation that we all face: the dreaded paywall and even situations when we should technically have access to content but through glitches in the systems / un-user friendly interfaces and bad design, we can be blocked. Another problem is that many mass media publishers, such as daily newspapers will refer to academic studies that 'prove' certain things. "cabbage gives you cancer" and the like. However if there is a link to any sort of research article or proper reference, once you go to access this article you will often be hit with a paywall notification. This is of course only true to people that do not have the required institutional login to access the content, but as we have already shown there is a madness to the general public funding research that they are then barred from reading. Lyn Robinson, who was sitting in on the lecture, emphasised that this shouldn't be described as a evil plot created by the publishers. Ernesto argued that, that description was far too simplistic and said that if there is a capitalist plot then it is one that is throughout society and is expressed in the commodification of EVERYTHING not just knowledge and scholarly communication. In my own view I would say that it is not a coincidence that we see the serials crisis happening at a time when the shaping role of the shareholder was rife through business (and still is usually) in the 1980s and 1990s. Publishing organisations realised that the power they held over the dissemination of scholarly communication was immense and that institutions could potentially be held to random financially to a profitable end. Ernesto then compared the publishing industry to fast food businesses, clubbing venues and rock bands. The thread that I followed was that there becomes a problem when large wealthy companies dominate a market. Everything is different for them, their advertising is completely different, their strategies are different, and this is also true for publishing. For journal publishers this is around reputation and markers like the impact factor. We also touched on the idea of the publisher as curator and selector, which has come up before in lessons. Lyn asked: What happened before the impact factor and when did it really start to have an impact? Ernesto admitted that he wasn't sure and they spoke about how worth was judged before IF. They also suggested that although scholarly publishing has become a lot more democratised a consequence is that there is a lot more red tape, more people to compete with and that (perhaps) it was simpler and easier before when the system was more elitist. My criticism of this thought process would be to ask - easier for you? and how representative was scholarly communication of more general human experience? If it was easier for default (white) man to get published, should be care? I personally think that the array of voices within scholarly publishing is a strength and that all is required is bodies who have the necessary skills to organise and curator this knowledge, perhaps this will be the publishers' new role. Ernesto asked "What is the role of the record label if people can publish from their bedroom?" Ernesto spoke about the beginnings of open access and how it was mainly within scientific disciplines also their article lengths were a lot shorter than those found in humanities subjects so could be stored cheaply in online systems. OA within the humanities, arts and social sciences have their own worth and evolution. We heard about the Budapest open access initiative. We were encouraged to look at the Finch Report on OA in 2012 which (as far as I understand) created a mandate that research which is publicly funded should be available OA to the public through institutional repositories - also known as green open access publishing. However I will endeavour to read the original report soon. Ernesto put forward the notion that "we can only agree that OA is good if we think that more people knowing more is a good thing." this would conflict with the corporate publishing model that knowledge is a commodity. Copyright law traditionally is about restricting distribution of content. OA is not a change in the selection or editorial model. It is a change in the pricing and permissions model. If citation in the end will determine the impact of a research publication, what is the harm posed by open access to quality? I will be looking for a copy of "Open Access" by Peter Suber in due course. c) it challenges me to create content, an important facet to the life-cycle of publishing. As Ernesto put it "not every readers writes but every writer has to read" [to read back their own work]. This week we considered the history of scholarly publishing. Ernesto emphasised the difference between 'scholarly', 'trade' and 'professional' publishing, (professional being a recent addition). That scholarly writing had grown out of the church (monasteries and theology texts) was mentioned, the royal society's contribution and the historical context of these traditions of publishing. We were shown (and got to touch) facsimiles of 19th century scholarly journals - both science related. I was struck by the format - tiny text laid out like an old fashioned broadsheet. Also the mix of content was striking; book reviews mixed with patent announcements but also poetry was included along the margins. We talked about how Philosophical Transactions of the Royal Society was the first academic journal (in the sense that we understand it to be) which was first published in 1665. Which, quite frankly, seems insanely long ago. Ernesto mentioned very briefly the 'uniform penny post' which enabled low cost subscription p+p and created an explosion in subscription publishing. I was intrigued by this, as I haven't come across it before. I looked at the postal reforms here: Rowland Hill & the Penny Black. However, I found little about their effect on publishing or on wider society. Ernesto described the different factions within scholarly publishing and how they interact, such as scholarly publishers' reliance on academic libraries for a large volume of their output. As disruption creeps into academic systems this has an effect on the publishing eco-system and also visa-verso. For example, the 'serials crisis' in which academic institutions could no longer afford the high prices of journal subscriptions. What is clear is that the balance between writers and reads is nothing compared to the effect that publishing operations have on these two occupations. It would seem an obvious point to make, but whoever has control over what is distributed in a society has immense influence over a populace. When the price of publishing is too high then output cannot be disseminated, but then the cost is too low or too easily available there is little room for development and investment in writing, art and curation. Publishing is then under valued as a pursuit. 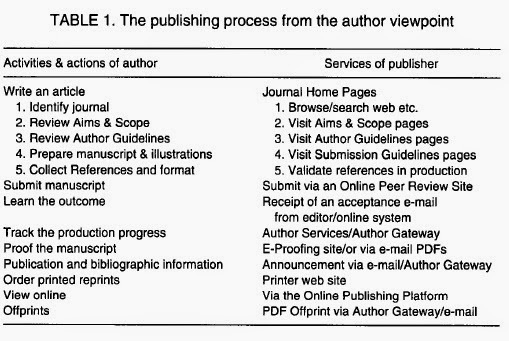 In one of the suggested journal article given to us by Ernesto I found an interesting table which outlines some of the different characteristics of the author and the publisher. The main difference between an author and a publisher would seem to be that an author creates something within a closed system. They create for their own reasons (even when there are multiple authors) and work toward a 'finished' text/output. Whereas, publishers are curators. They manage content, administrate systems for readers and writers and stimulate production. A publisher's role and existence is dependent on there being a producer/writer (even then the publisher is themself the writer). Binfield, Peter, Rolnik, Zachary, Brown, Cindy and Cole, Kerry (2008) "Academic Journal Publishing", The Serials Librarian: From the Printed Page to the Digital Age, 54:1-2, 141-153, http://dx.doi.org/10.1080/03615260801973992 [accessed 02/03/2015]. Who are we advocating for? Our patrons or corporate publishers? This week we focused on the ethics and moral considerations of copyright within publishing and how it relate to our understanding of 'the death of the @uthor' as librarians. We were challenged to consider whether copyright is always applicable in all situations especially when the infringement is so slight and not at all disruptive to copyright holders' income. We were shown examples of when people - who did not set out to rip off anyone - faced fines / criminal investigation and removal of content after post material that included copyrighted material. These examples (the librarians and the mother, see links below) showed times when 'fair dealing' can be considered a needed concept as these individuals did little to no harm to the copyright holder's finances. As said at the beginning of 'Steal This Film II' (2007): "This is not a film about piracy... This is not a film about sharing files... It's a film that explores [massive] changes in the way we produce, distribute and consume media"
I was also very glad to hear about Larry Lessig who advocates for progressive copyright laws and has been a major participant in the creative commons movement. As someone who strongly believes in the creative force of sharing and the history of replication / re appropriation / and adaptation in the evolution of art practices, our shared culture exists because we are able to take ideas (that haven't been claimed by intellectual property) and change them for our own end. Take Sir Tim Berners-Lee's example. Instead of cashing in on the world wide web he gave it to the world for free. That isn't to say that I am against intellectual property full-stop. There are many musicians/composers who would have been left penniless if it wasn't for royalty cheques - I'm thinking more blues artists, less beatles....(more little guy, less rich establishment). However, when large corporations with teams of lawyers can go after private individuals who have not profited from copyright infrighments, the scales of balance seem a bit off. I have to admit that I was rather overwhelmed by the amount of reading to be done before this lesson. However, I am glad of the chance to study philosophers in more detail that are important in some way to library and information science. Unfortunately I only have enough time to skim the essays. I'm just glad that I have already read some Barthes and Derrida, so Foucault wasn't as daunting as he might have been otherwise! What I found to be central to this essay was the notion that the traditional structures of author and audience were over and that different relationships need to be built. Ernesto pointed out in the lesson that there is an inherit contradiction at work here. Foucault, arguably one of the most important philosophers of the 20th century, is arguing that the tradition of the celebrated author is gone while himself enjoys stardom and acclaim primarily through his writings (authorship). The writer who is proclaiming the death of authorship does so through authorship. So what if it's not simply death of an author, i.e. the time of authorship is death, but perhaps this is the death of a singular published voice. That collaborative authorship offers publishing a new dimension and also that authorship from a singular voice is more scattered across the informational landscape than ever before. As Matthew Kirschenbaum puts it in 'what is an @uthor?' "...Today you cannot write seriously about contemporary literature without taking into account myriad channels and venues for online exchange." but what is important to remember is that sifting through someone's output (whether a professional writer or not) becomes a choice of what to include and exclude, as there is too much ephemera to aggregate or even to remember. Documenting and archiving can be a creative process as you are establishing a perceptive of what is and isn't said and remembered about an author's output. I am interested in the idea of official and unofficial narratives and how these are dictated by power structures. Who gets to tell the official version of events and how is this documented? All of which is highly political. Once back from a quick break, we were lucky enough to receive a presentation and led-discussion from Eliza Anyangwe who works for the Guardian's professional networks. She gave us a useful insight into the inter-workings of the guardian and addressed some difficult decisions that have been made and will be made with modern news/media publishing. As we are moving beyond a system of per print customer purchase - i.e. one person buys one newspaper, once a day... toward online free content, we must consider how to fund journalism within this new climate. Do we include more advertising or ask readers for donations? do we pay just 'official' journalists or amateur writers who create valuable content? and how is this done in a news organisation that has a particular editorial style and quality? A lot of interesting and relevant thoughts were shared. As I am time poor, and the ever librarian, I have come across some helpful resources for unpacking some of the key notions of the philosophers which we are grappling with. "Critical theory for library and information science: exploring the social from across the discipline" (2010) which has chapters devoted to different philosophical ideas and philosophers who are relevant to library and information science. There is a very good chapter devoted to Foucault which I would recommend. I'm off to Spain for 5 days, see you all next Friday! Despite the fact that I was ill for this week session, I have looked at the slides provided on moodle, read the suggested reading and conducted my own reading to support my learning concerning this week's lecture. From the slides which were uploaded there were a few concepts that particularly caught my attention: the effect of media subjectivity on a reader's perspective and the knowledge economy which I had already come across in Lyn and David's chapter "Information Society" in which it is used as one definition of what the information society might be. What is clear straight away is that this was an extremely packed session; spanning the invention of paper, introduction to McLuhan, further thoughts on the theories of Walter Benjamin and disruptive technologies. I must confess that I have prior interest in all of these, however in writing this blog it is extremely difficult to knit them all together - as I'm sure Ernesto did seamlessly during the lecture. Obviously, publishing in every sense runs through all of them. I'm sure if I was there I would have got it. It seems that we are stepping away from our basis as 'LIS professionals' into uncharted territory as readers, writers, social commentators, philosophers and producers. The essay on the history of paper in china was interesting to me as it reminded me that a) as writers and as readers we have a cultural bias which informs our understanding of history and b) technology has a disruptive affect on society (in this case paper) even when it is not acknowledged as a disruptive technology. The information concerning Marshall McLuhan was also welcome. I wonder if a discussion was had about the later 1960's reprinting of his chapter 'medium is the message' as 'medium is the massage' in which graphics and text are explored to express the reprint-authors' interpretation of McLuhan's ideas. I wonder whether Ernesto (or anyone else in the class) has read 'The Alphabet versus the Goddess' in which McLuhan's notion that the way by which information is carried can have a bigger affect on society than the contents, is expanded and fused with neurosurgery to create the thought-provoking hypnosis that - due to our brain's separate and specialised hemispheres the technology of the alphabet has had a damaging and lasting influence on the development of our brains. Shlain suggests that the world's shift from goddess and image worship to male gods and patriarchy have come about because of an emphasis on right-brain specialised skills such as writing which causes linear thinking, conceptualisation and violent pursuits to become rife within a society. Whether or not you believe or argee with Shlain, this notion is appealing - that disruptive technology have a significant affect on a collection of people as it inform how they live their lives. In 'The Alphabet versus the Godess' Shlain devotes a chapter to china and its technology, as such I would very much endorse you read it. I have to admit that every time I have read about the 'information society' every definition I have ever come across has left me uncomfortable. 'Knowledge Economy' is no different. In the writing taken from Credo, the authors describe an information economy in which western countries control their population through information technologies which dictate industry as well as workers' skills (as information workers, wooly definition...). I find the 'triple helix' (Leydesdorf, 2010) notion particularly frustrating. Also the idea that the information society is 'soft capitalism' is really scary. Personally I think that all societies are dependent on the transmission of information. Any society with a language of any sort is an information society. As Ernesto put it last lesson society is "a series of relationships" which depend on knowledge and the sharing of information. The idea that the control of resources or (I hate myself for saying it) 'intangible good' elevates a (usually western) society to that of an information society is just stupid. The Society of Chief Librarians, Sopra Steria and visa/immigration services in libraries!